Many developed countries take waste management really seriously but in Nepal, save for few campaigns by some non-governmental organizations, we have not yet talked about it at the national level. Citizens of developing countries are demanding and consuming electronic goods without considering their proper disposal after use. Electronic waste—also called e-waste—remains least talked about issue here. The electronic goods that are discarded after the end of their useful life are called e-waste. This also includes electronic goods that are re-used, salvaged, recycled or disposed. Unlike traditional wastes like iron, glass, paper and organic waste, this waste cannot be dumped in the land directly. They don’t disintegrate easily either, rather they get accumulated and demand more area of land in dumping sites. Additionally, they need to be handled safely as they contain many heavy metals. When broken down, e-waste emits numerous types of poisonous elements such as lead, mercury and barium—which when exposed—pose a serious health hazards to the workers in land fill sites. Children and elderly people are affected the most. When the children play, break and lick these gadgets, they get exposed to harmful elements which may retard neurons development. These heavy metals affect the nervous system, heart, lungs, spleen, muscles etc Prolonged exposure may even cause cancer cells to develop in human body. E-wastes have serious effect on environment as well. Due to the lack of awareness regarding e- waste, people in Nepal dispose mobile phones, TV sets, refrigerators, circuit boards and electric toys in their backyard or land fill sites. When these goods reach our soil, it might result in acidification of soil, loss of agriculture land and aquatic lives. Later these harmful chemicals get deposited in plant leaves, stem and fruit. When such fruit or plant is consumed we consume those harmful elements as well. In some conditions, these leaches reach the underground water, polluting main source of our water. When we burn down the e-wastes, it multiplies the hazard. When burnt, these wastes emit poisonous gases as the metal oxides. These gases cause severe damage to our lungs, central nervous system and brain. We must be really serious about proper disposal of e-wastes. In the past ten years, we have nearly doubled our consumption of electronic goods. As technology is upgrading minute by minute we strive for advanced electronic goods. We also import secondhand goods dumped after use from other nations. Mostly, e-wastes generated in developed nations end up in developing and under developed countries through secondary market. These low priced goods are purchased by people with similar range of income in developing nations. This is how we are accumulating wastes from developed nations in our country. In the long-run, these goods will be disposed in our land fill sites, causing negative impact on environment and human health. India passed the bill on transboundary rules on hazardous wastes in 2016 banning the import of e-wastes and other hazardous wastes. Nepal can no longer export its e-wastes to India for recycling but they are still illegally transported to India. This does not help in sustainable management of e-wastes. Thus we must immediately draft a policy regarding e-wastes. The government must immediately build a safe processing plant of e-wastes. We don’t have exact data on the amount of this modern waste, but its increase is going unabated. Our youths who go to the Gulf countries for employment come back with a lot of TVs, laptop computers, mobile phones and other household electric appliances. These gadgets will ultimately add to the piles of e-wastes we already have. 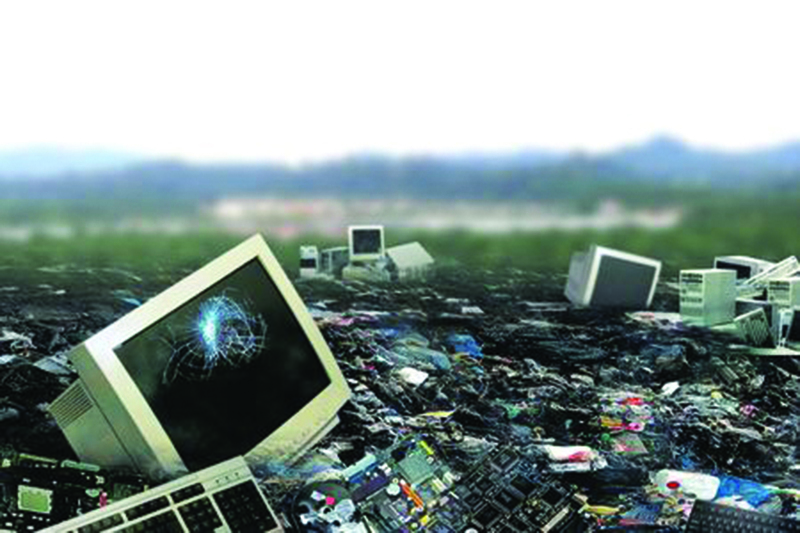 The government must not allow people to dispose e-wastes wherever they like. A separate area of land should be designated for disposing only e-wastes and the generators of e-wastes, the people, should be made to pay a certain amount of money as recycling fee. This is exactly how e-wastes are managed in the developed nations. This will help the government to generate some revenue and also contribute to reducing environment pollution. Sustainable and healthy environment can be achieved only when we wisely manage our e-wastes.